Quick post, then back to packing! [5e30db864b155f98044e9c18d3582d35_l.jpg] After a rough Friday morning, my team decided to add a canburglar to our robot right after lunch. With parts from 4265 and a hook design from 3824 (thank y’all both for the great help!!) we were able to get it built and attached by 3PM and working for our final Friday matches. As always, the deadline is nominally Sunday at midnight Eastern. I’ll be at the Smoky Mountains Regional with 1293, so feel free to submit your entry in person. Uh, guys? The custodians are looking at our robot enviously. How fast can we get the important parts off of it? Disable that robot! We’re the FBI. Hey guys, you did remember to program it to release the can, right? Right? I wouldn’t touch that garbage can with a 10’ pole. Let’s get the robot to take it outside. See, even the robot uses a 10’ pole. The students in that picture were clearly assigned by their mentors to go take out the trash. However they didn’t want that, so they just made the robot do it. 5 seconds to grab a can? We’re going to be hard to beat! Collecting cans and bottles for fundraising turned out to be a net loss after the team decided to build a robot for the task. Hey, do you know where they store the blue banners? We need it for… research. The student on the right is wearing a hardhat because he was hit in the head with the canburglar during prior testing. Finally, a technical solution for those water bottles that get left all around the shop! Which came first, using it as a weapon or using it to grab RECYCLING CONTAINERS? The life of a T-Rex has never been easier after building one of these. 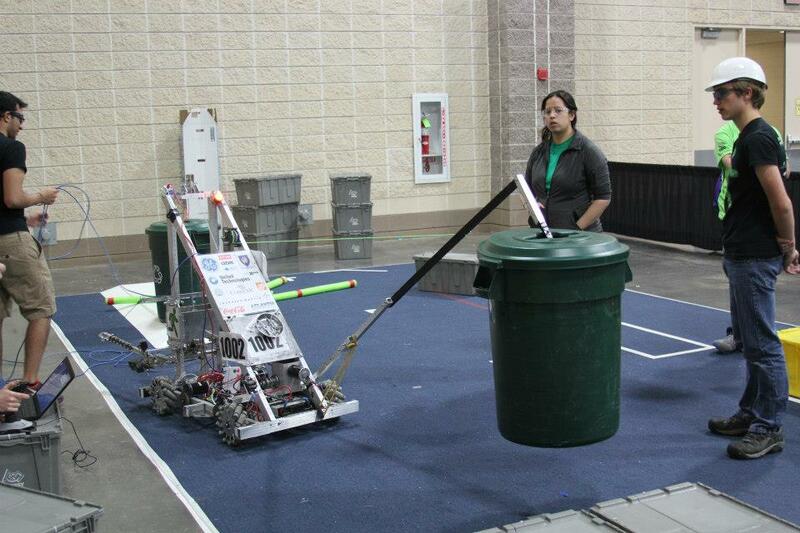 hey, if waste management wants to sponsor us… we do what we gotta do, our robot isn’t usually trashy, but 20 dollars is 20 dollars. 'Cause if you don’t have a canburglar, the recycling isn’t really a rush. Smoky was a trip, but let’s get to judging!